The Humboldt Penguin (Spheniscus humboldti) is a South American penguin, breeding in coastal Peru and Chile. 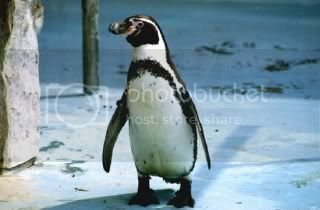 Its nearest relatives are the African Penguin, the Magellanic Penguin and the Galapagos Penguin. Humboldt Penguins are medium-sized, black and white penguins, growing to 53 cm tall. They have a black head with a white border running from behind the eye, around the black ear-coverts and chin, to join on the throat. They have blackish-grey upperparts and whitish underparts, with a black breast-band extending down the flanks to the thigh. They have a fleshy-pink base to the bill. Juveniles have dark heads and no breast-band. This penguin nests on islands and rocky coasts, burrowing holes in guano and sometimes using scrapes or caves. The current status of this penguin is vulnerable, due to a declining population caused in part by over-fishing. Historically it was the victim of guano over-exploitation.